Excel Simulations: Solve Problems with Excel by Dr. Gerard Verschuuren. "This is a fun book about Microsoft Excel. 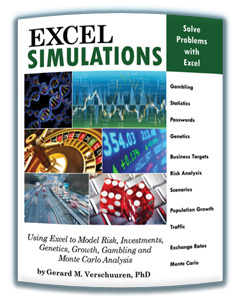 It covers using Excel for a variety of simulations - from Gambling to Genetics. Most books in this category are $100+ Text Books. This title offers a solid introduction to using Microsoft Excel Simulations in the disciplines of Business, Science, and Casino Gaming."